This morning I sat my fifth graders down to a new read aloud. “Is it a chapter book? I hope so; I do lots of thinking in chapter books,” A. said. For the last three weeks, I’ve read picture books. Great books. The choice was intentional. And they have done good work. But, now they are itching for a good novel. One that sweeps them up off their feet, just like Some Kind of Courage by Dan Geimeinhart did. I read Jason Reynold’s Ghost over the Thanksgiving break, and I was fairly sure it would be a perfect fit. Reynolds has an amazing way of inhabiting a character. He puts you right there. Even if it isn’t your experience, when you read his words it becomes yours. I shared a picture of Jason signing our class copy. “What did he say when he signed it? Before I read one word, their hearts are in it. They love this guy. The provocative subtitle pulled at them making them think. After chapter one, we don’t know why our main character is the way he is, but we have theories and wonderings. That’s the work we do at the beginning of a book. We try to make sense of the confusing place the writer has landed us in. He eats sunflower seeds and talks about world records. Why the heck is this 12-year old (we figured that out) not wanting to get home? Why is he walking home, when he could take the bus home? After a bit of reading, I ask students to reconsider the subtitle. They explode with ideas that are stronger and specific to the story so far. The wheels are turning not just about what happened, and what might happen, but why things are happening. We’re busy noticing and wondering and revising our thinking about the character and his journey. This reading work we do when we start a book; it’s our journey. They are doing as “A” said lots of thinking. Time flies, and we have to stop, for music. There are protests and groans of “noooo! ” Music to my ears. No worries, I tell them, there’s tomorrow. Thank you, Two Writing Teachers for Slice of Life Tuesday. Read more slices here. I don’t know this book!! Thanks to you, though, I am set up to read it so well! I love that you showed me the author and I could “hear” how excited your students were as you started this book! Heading now to see if it is at the library!! Might have to pick this one up at the book fair this week. I love that students aren’t only seeing themselves in books, but are also seeing people like them writing those books. These words say it all: …we have theories and wonderings. This SOL allowed me to peek into your classroom and see how dynamic and loving it is. I plan to pick up CHOST to read. thank you. I just read it, too. Thank you for inviting me into your class to experience how your class is thinking about the book. I love being in your classroom with you. Thank you for inviting me in. I wish I could hear you read Ghost. Love hearing all this and just bought the book for myself yesterday! You’ve made me miss my read alouds! I’ve been meaning to read this book to my class and now you have certainly convinced me to do so. Thanks. Happy reading. Looking forward to receiving this book from my Atlanta purchases! Loved listening to your students’ thoughts – they are off to a powerful beginning. I wish I could have seen Jason Reynolds receive the Charlotte Huck Award at NCTE. 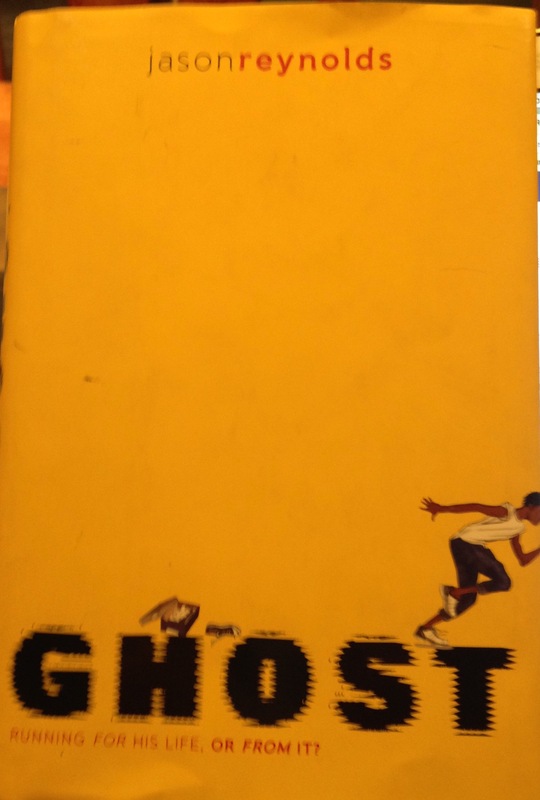 I have a copy of Ghost but haven’t read it yet. I’ll consider it for our next read aloud. Thanks for the recommendation. Thank you for sharing these magical read-aloud moments with us, Julieanne! Can’t wait to get a copy of this book! Cheers to all the reading and thinking!